1. Layer in light. In this relatively small space, a beautiful lantern, table lamp and sconce create different lighting options for different moods. The Moroccan lantern, chinoiserie lamp and iron sconce each add a unique style to the space in addition to the glow. 2. Provide an artful story. 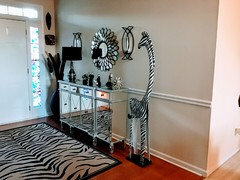 In most apartments, the entry space is small, but that doesn’t mean you can’t make a big statement. 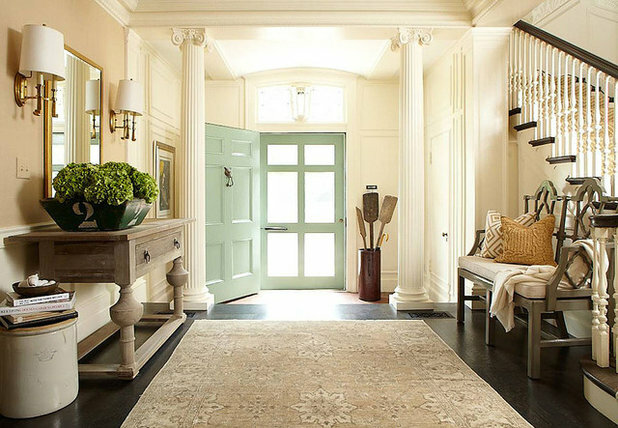 This home is bold and chic right from the entryway. 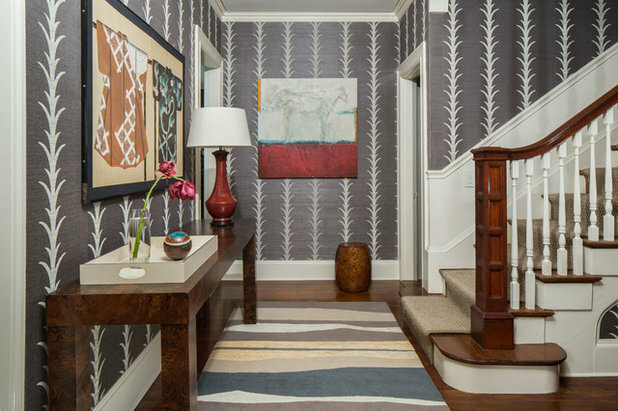 A Jackson Pollack-like wallcovering, plush stools, a statement mirror and a geometric rug welcome guests and let them know they are entering a stylish home. 3. Get the scale right. A grand foyer with one tiny table is a sad state of affairs. 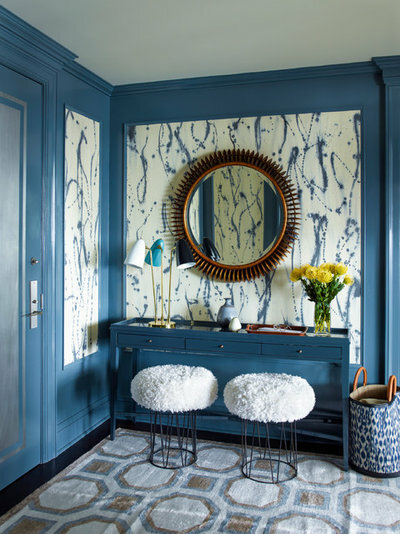 In this beautiful entryway, a large console table, a bench, a mirror and sconces stand up to the large space and architectural elements such as the columns. 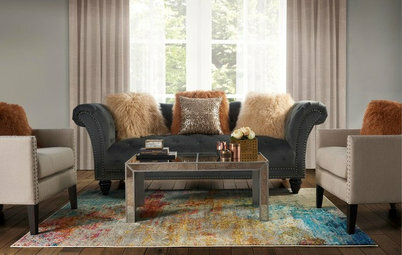 In addition, accents like the antique crock, bin of flowers, umbrella stand and throw pillows add personality. 4. 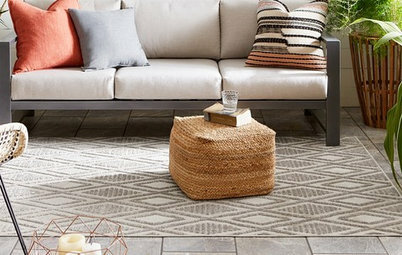 Foreshadow your home’s style. 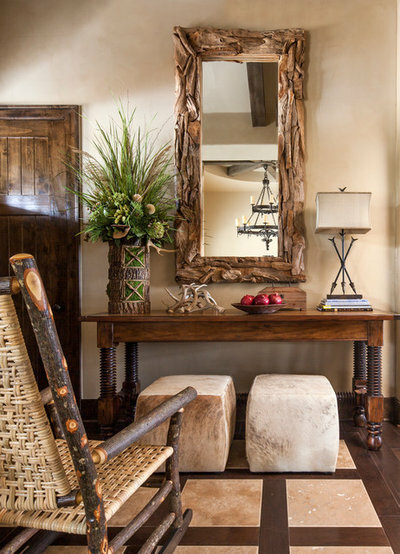 Interior designer Jeannie Balsom used wood, iron and other rustic textures throughout this relaxed retreat. 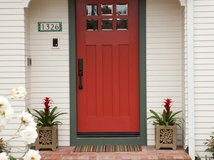 Using this mix at the entry sets the tone and lets visitors know exactly what they are walking into from the front door. 5. 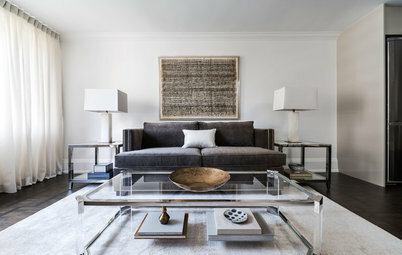 Add a rug. Sometimes the dimensions of an entry seem tricky for a rug. 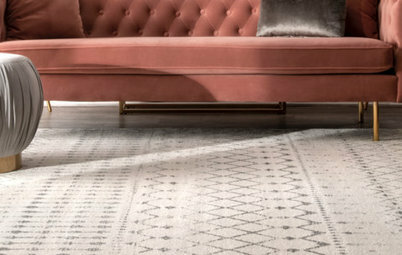 But the floor is a great place to add pattern, color and softness. 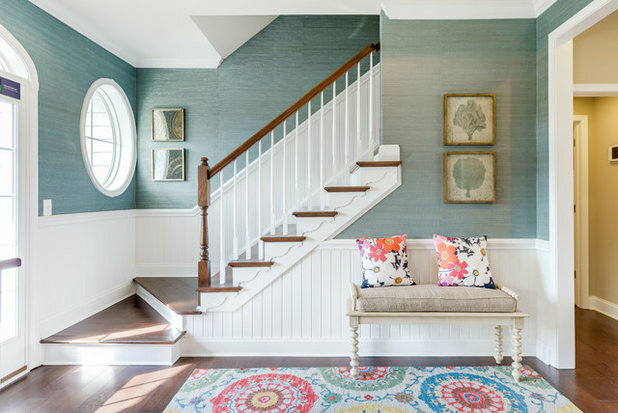 Because an entry is a high-traffic area, pick a rug that’s durable enough to stand up to heavy use. 6. Go bold. 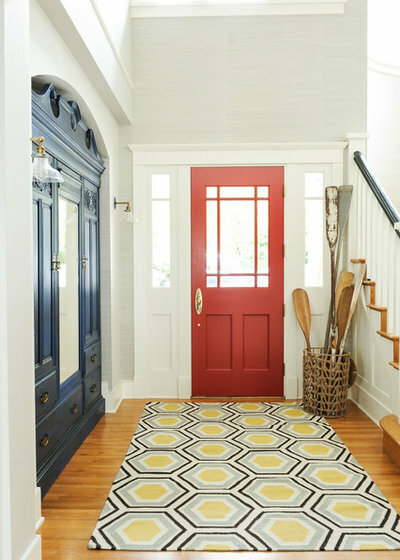 Primary colors provide an exciting entrance in this Vancouver beach house. While a basket of oars nods to nautical style, the geometric rug and bright colors are unexpected and playful. 7. Dazzle with wallpaper. 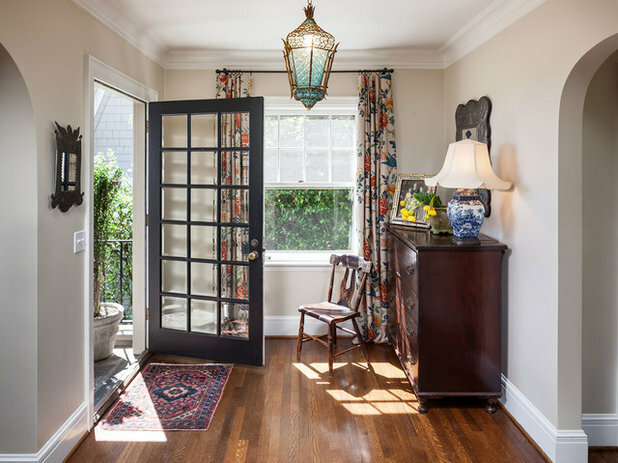 This entryway to a circa-1900 house in Providence, Rhode Island, needed to respect the architecture but also to suit the homeowners’ chic personal styles. The designers at Taste Design chose a bold grass cloth wallcovering with vertical lines of acanthus leaves, giving the classical ornament a modern twist. 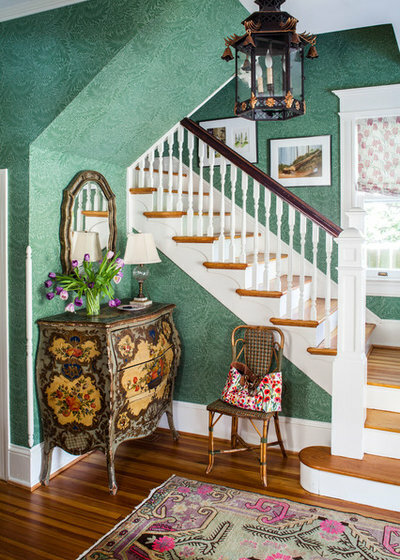 The wallcovering also suits the client’s art collection and easily transitions from the foyer up the staircase. 8. Provide a place for stuff to land. 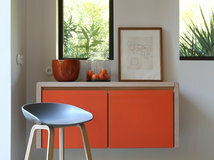 A dresser, chest or console table with drawers will help you keep the entry from becoming cluttered whether you need to ditch mail, keys or gloves. 9. Provide a transition. 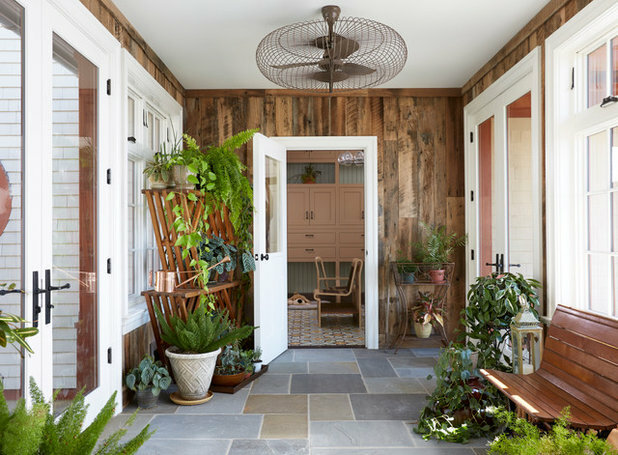 In this entry, plants, a stone floor, outdoor furniture and rich wood provide an easy transitional zone between indoors and out. 10. Add local flavor. 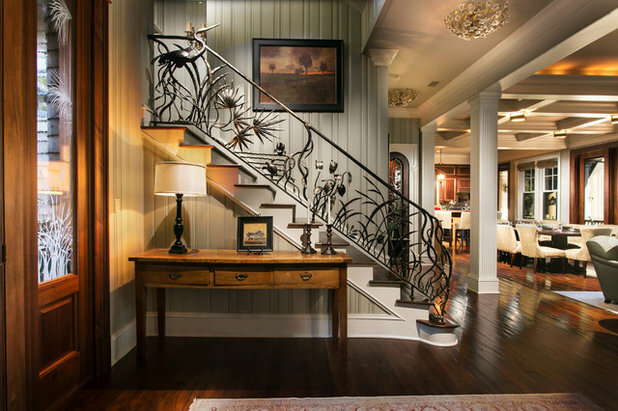 In this Kiawah Island, South Carolina, home, the spectacular staircase railing depicts local flora and fauna. 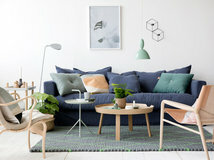 While I usually try to avoid writing the overused phrase “bring the outdoors in,” this is the epitome of accomplishing that in a beautiful and unique way. All I can envision going up that last staircase is snagging one's clothing on all of the metal artwork. It should be on a wall, not on a staircase!